A few weeks ago a friend asked me to show her how to make pie crust. When I asked what kind of pie she wanted to make, she suggested a sweet potato pie. I’m ashamed to admit it, but I’ve never had a sweet potato pie. Nonetheless, I agreed and sought out a recipe. 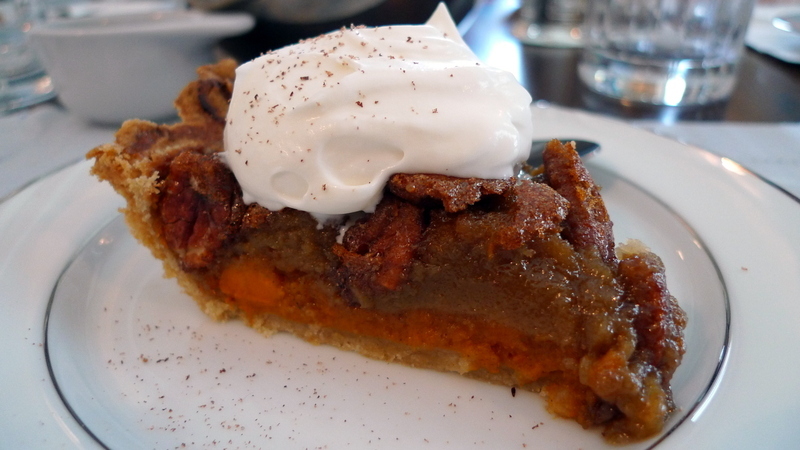 Ultimately, I settled on a combination sweet potato / pecan pie. The sweet potato pie isn’t that far off from a pumpkin pie. You roast sweet potatoes, skin them,then mix the flesh with sugar, a little salt, and an egg. 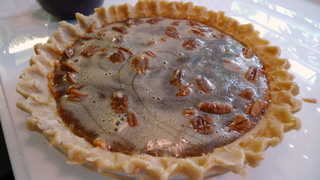 That filling is put into an unbaked pie shell and topped with pecans and a pecan pie filling – a sugar syrup and egg mixture. Bake it until set. End result with freshly made whipped cream. Turned out nicely! This entry was posted in Uncategorized and tagged baking, cooking, dessert, food, Pecan, Pie, SweetPotato by christao408. Bookmark the permalink. You are a master ! Nom, nom. Would have been perfect with my afternoon tea. Never thought of combining the two ingredients but it looks delicious. looks delicious! sweet potato pies always confused me because after you spice them, they taste pretty much like pumpkin pies. i feel like the two should taste distinct, but i haven’t experimented enough to bring out the unique flavors of the pumpkin versus the sweet potato. omg so tempting to make! i prefer pumpkin but sweet potato pie is a close second. I never had that combo though. It looks scrumpdillyicous! Now I really want to learn how to bake. And this should be my go-to recipe. I wonder if you know how to make a tomato pie. If so, then please do share! I’ll definitely take a whole pie of that please, my good sir! Beautiful, simply delicious. Boy have you let a baking fire unde r me! Food is love ! 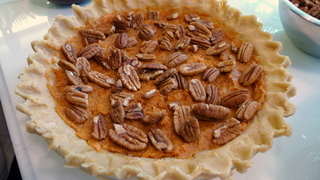 i love sweet potatoe pie but i have never had it with pecans however this week my sister bade the most delicious pecan pie. she picked the pecans in texas and brought them home then shared the pie with us. I am sure it was very good. You make the art of making pies seem so easy. I would love to be able to make a good pie sometime. The pictures and the recipe look so delicious. What was the recipe? Could a beginner baker who specializes in making bone dry muffins bake something like this? It really looks good. I love pecans and I know I’ll love this pie. @ElusiveWords – Hi Matt – it was this recipe from Emeril Legasse on Foodnetwork.com. I think you’d be able to do this just fine. Pie crust is much more forgiving than folks realize. Even if it falls apart, you can patch it back together in the pan and it will bake up nicely. @ZSA_MD – I’m sure you could make wonderful pies, Dr. Zakiah. Everything else you cook is tasty, why not try a pie!? @kunhuo42 – Well, that’s the same realization I came to, Dr. Aaron. (Have to add the title now!) There’s not much difference between sweet potatoes and pumpkins when it comes down to the flavor. That’s one reason adding the pecan layer is nice. Otherwise, there’s a whole lotta sweet potato (or pumpkin) flavor going on. @Ikwa – @Fatcat723 – @murisopsis – As I mentioned to Aaron, one of the reasons I like the combination is that sweet potao or pumpkin can be a very overwhelming flavor. Combining it with pecan helps to break it up a bit. @grannykaren – Texas pecans are fantastic. I always buy my pecans in the US and carry them back. @Roadlesstaken – Order noted! @iskrak – Would love to try your version. @nov_way – Interesting… have never heard of a tomato pie. Is this another name for a pizza? =D@stepaside_loser – @beowulf222 – @catstemplar2 – @SistahWarhol – Thank you, thank you… glad you enjoyed the entry. It looks great. I thought I would never say this, but I find myself getting a lot more interested in cooking these days! @Dezinerdreams – That’s fantastic news Vivek! @christine24666 – It’s a good kind of envy to have, isn’t it? @nov_way – Went out and researched it. Sounds good. Unfortunately, the large tomatoes we get here in Thailand tend to be really pink and crunchy… maybe not so good for a tomato pie. Maybe when I’m back in the US this summer I can bake one. love it!I do it the other way around sometimes. Cook pumpkin like sweet potato!